FACE OFF: Season 3 Premiere! Star Wars Challenge Tougher For Some! Syfy’s visionary competition reality show where VFX artists’ imaginations result into interesting creations, returns for a third season Tuesday, August 21 at 9/8 central. Sean Astin (L) judging a challenge with host McKenzie Westmore. The ninety-minute season premiere will feature actor Sean Astin (Lord of the Rings) as a guest judge. “Face Off” host, McKenzie Westmore said during a recent press conference interview about the first episode, “It opens up with a great Foundation challenge to showcase the talent and tell us who they are. Then it moves into the big opening the ‘Star Wars’ challenge.” This challenge will be for artists to recreate the famous Cantina scene from “Star Wars” on the “Face Off” stage. She also said that this season there will be a lot of female talented make-up artists. 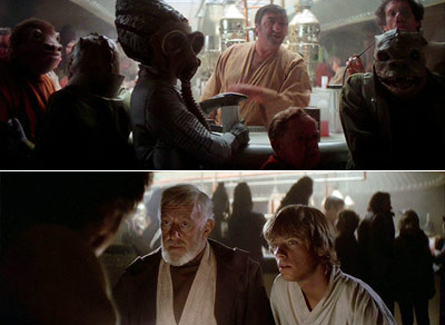 Famous Star Wars Cantina scene (pictured above). This was indeed more of a challenge for one particular contestant said one of the show’s judges Ve Neill who said that this contestant had never seen “Star Wars”. Neill rest assures, however, that this make-up artist still managed to pull-off an impressive creation. Joining the judging panel this season will be Neville Page, Lead Creature Designer on Avatar. Neill said that with Page on the panel, it doesn’t change the dynamic as when Patrick Tatopoulos is in the judge’s seat. Both men as creature designers provide the same element during the deliberations in choosing who will be eliminated at the end of each show. A contestant completing his challenge in “Face Off”. Other celebrity contestants that they talked about this season are Laila Ali, and Kevin Smith. 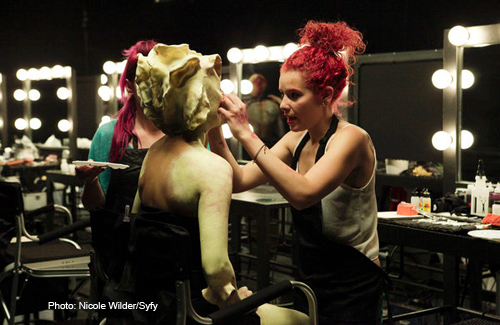 FACE OFF finale sneak-peek: Viewers will vote for the winner!